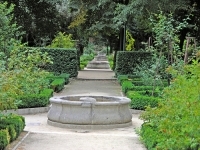 Located nearby the Prado Museum, the Royal Botanic Garden of Madrid is one of the oldest botanic gardens in Europe. With the foundation of the garden ordered by King Ferdinand VI in 1755, the Royal Botanic Garden has been cataloguing and nurturing rare species of flora for over 200 years. A welcome break after hours of art, architecture, and frenetic streets, the garden is a small haven of natural splendour. Divided into three terraces and extending only eight hectares, the garden boasts an array of 30,000 plants and flowers and 1,500 trees. Not only interested in exhibiting plants, the gardens' initial aim was to teach botany, and to promote expeditions to discover new plant species and classification. Nowadays the Royal Botanic Garden houses a cutting edge research centre, an extensive herbarium and a large library. Visit the Classical Romantic Garden, Villanueva Pavilion, the Graells Greenhouse and the Exhibition Greenhouse. Guided tours can be arranged (best to book in advance via the website), but there is also a series of self-guided tours set out on the website, suggesting what to see on a number of trips to the garden arranged by themes like 'the evolution of the plant kingdom', 'aromatic plants' and 'outstanding trees'. Admission: €3 adults; concessions available. Children under ten are free.